We celebrated my youngest son's 24th birthday today as he came home for a visit from Saint John where he works. It's about four hours form here. I'm not kidding myself though, mostly why he came was that his girlfriend is also here for the summer and he hadn't seen her for a few weeks. The weather was perfect though, so we spent a good part of yesterday outside and had a barbecue for supper. Jeremy always does the barbecueing and is much better at it than me or his father. This morning we went out for breakfast with him and his girlfriend , her parents and grandmother. Later he left to visit his grandparents who have a place at the beach near here. 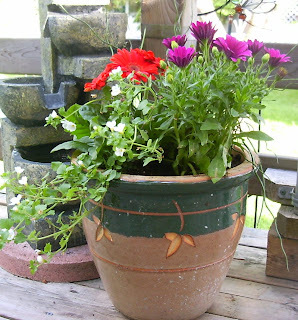 It was cooler today and very windy which made it just perfect to do a little gardening. 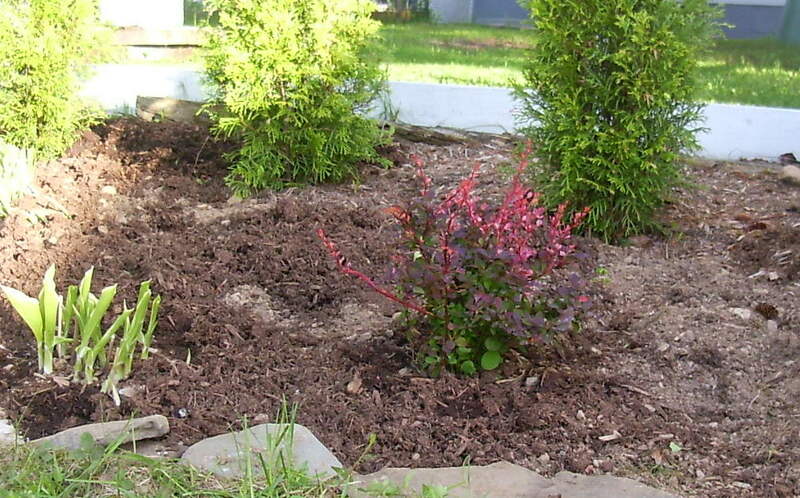 I've slowly been cleaning and mulching my gardens a little bit at a time. The best time is for me to do a little before lunch, and then I still need to rest in the afternoon. 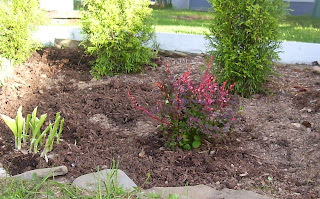 I planted a little Bayberry bush at the back of our yard where I have started a cedar hedge. 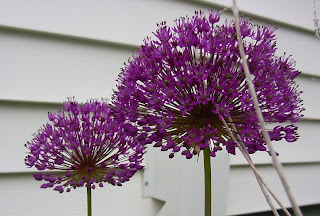 I'm looking forward to the color in the fall as well as the berries that will attract the birds. Today, though, I rested out on my deck swing. It is a very small deck, but it is my favorite place in the world right now. I have a little fountain, some flowers and some shade. I laid there for almost 3 hours today while reading and enjoying the wind in the trees overhead and listening to the birdsong. 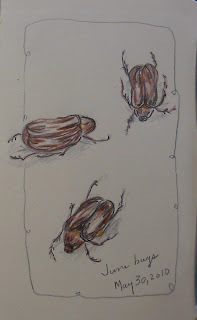 I also took some time to do this little drawing of a June bug found on the deck. I wonder how long their lifespan is and why we always find them dead in the morning. I don't particularly like them when they're beating on my screen here in my sewing room after dark--to be honest they give me the creeps. When they're dead--I know it's mean--they are interesting. I had 2 appointments today--one at the hospital and one at the dentist. When I came home in between and checked my mailbox there was a package. My first thought was, did I order fabric and forget about it, but no, it was a surprise gift from an aunt that I correspond with via email. Really we are more like sisters in our age differences. 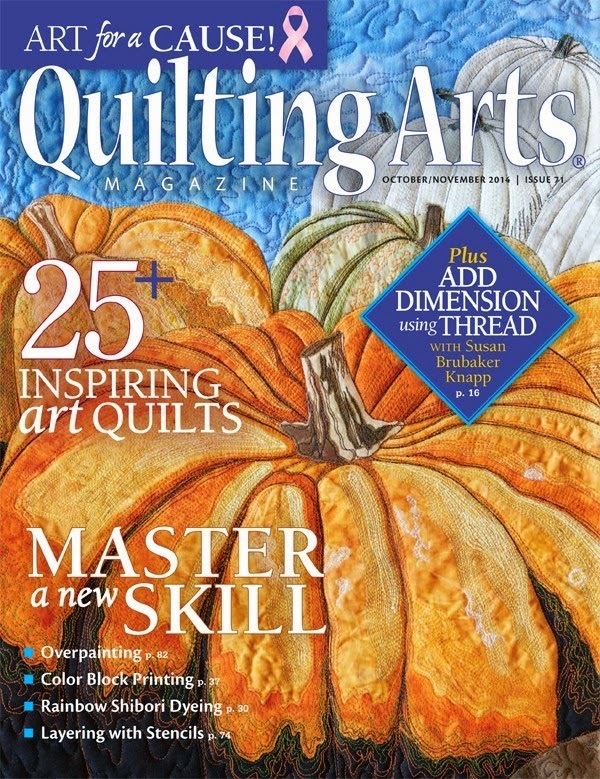 She is also a sewer and a quilter, and so picked out a very nice tote bag kit to cheer me up. The colors are beautiful. Today was also the day that I meet with my journal swap friends to exchange our page and choose the new theme. This month's theme was flowers, and you can see the diversity of the group in the following pictures.. We are 4 here and there are some who send from afar. One of our group was sick so I have 3 photos to show. The first is the one that I received this time from Nicole. It is mostly collaged with some embellishments and machine stitching added. 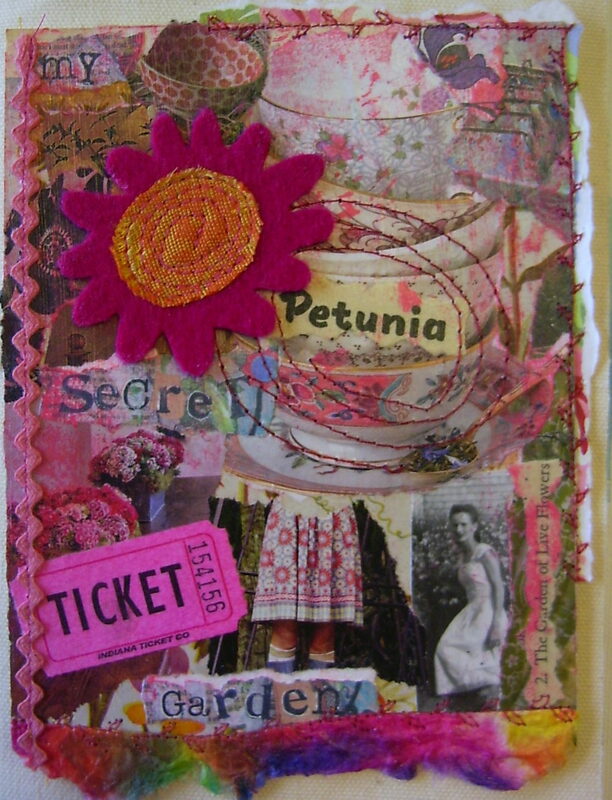 I just love her sense of whimsy and color. 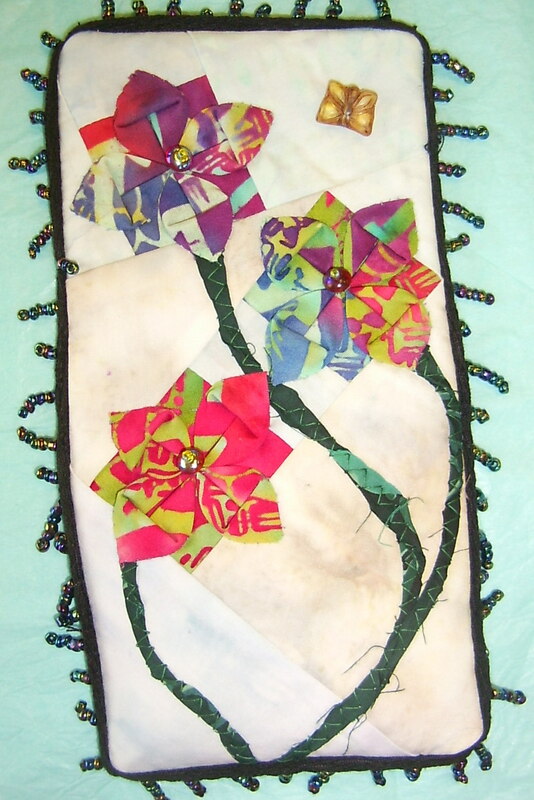 This one was done by Anne as an experiment in fabric origami. I like the added beads. This last one is the one that I did. 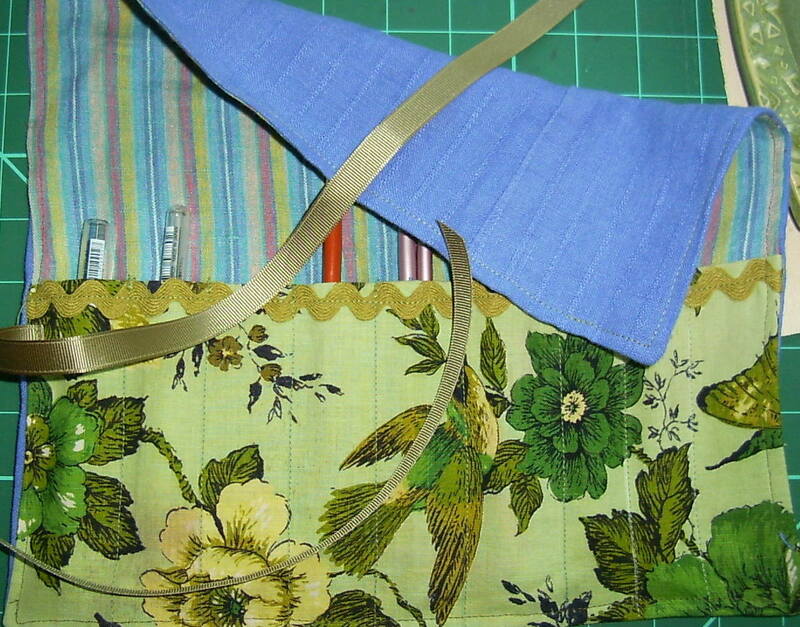 I used the paper fabric technique--tissue paper applied with glue to muslin with various bits of paper scraps in between. Then I stamped, painted, stitched, and applied some foil for highlights. I thought you might like to see the progression of the little doll. Since I was out all day today, this is as far as I got. She's cute so far. It seems that my overnight trip to Fredericton took quite a bit out of me. I had a couple of 'resting days' but I felt better today. 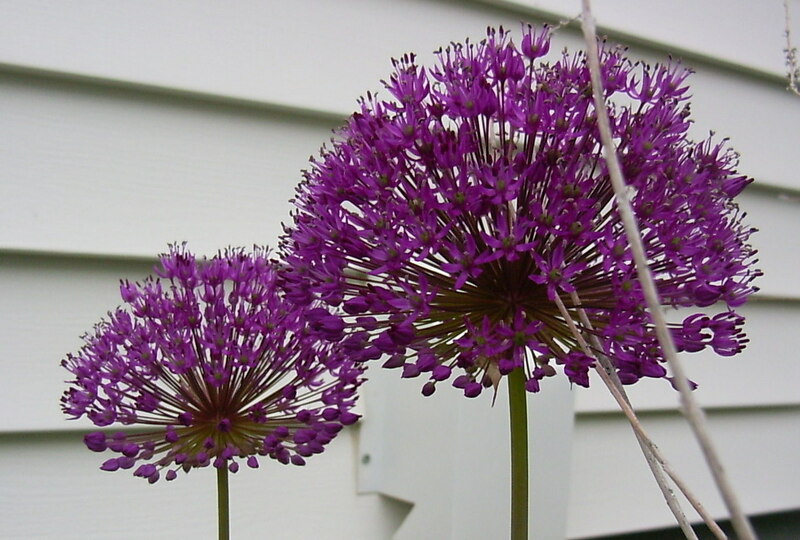 I've been working on 2 small things which I cannot show yet, so I thought that I would show some of my first blooms in my garden. The tulips have just finished and this is what is blossoming now. 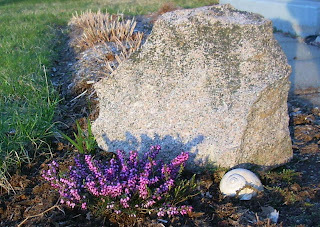 I have not had smell for years, but because of thee large amounts of Cortisone I've been on this winter, I am smelling all the spring smells for the fist time in a long time. I even noticed the fresh cut grass smell the other night. Wow! That's beautiful! 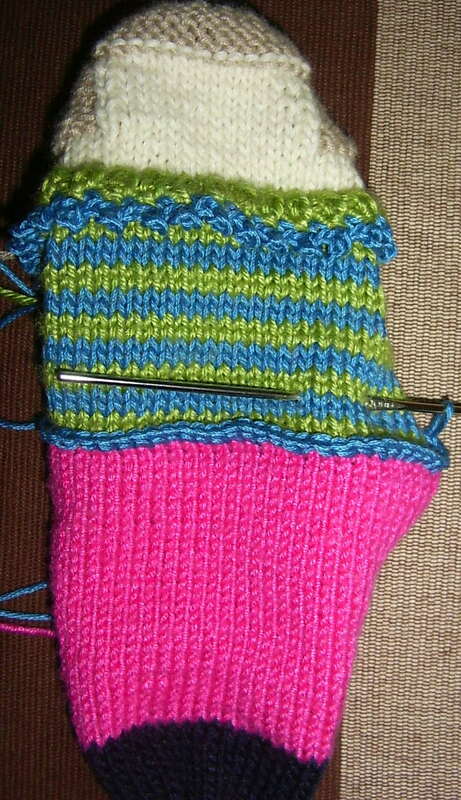 As for my knitting, I just can't stick with any one thing. It's my brain right now. I found this pattern from a 1987 woman's Day magazine. I'm using cotton which is a smaller weight and I'm adding some crocheted trim. I've just picked up stitches for a skirt. She will have a hat too. Can you picture it? She made it! What made this graduation especially moving for us was that our daughter tried 2 different universities, finished 1 year, and then decided she wasn't going back. 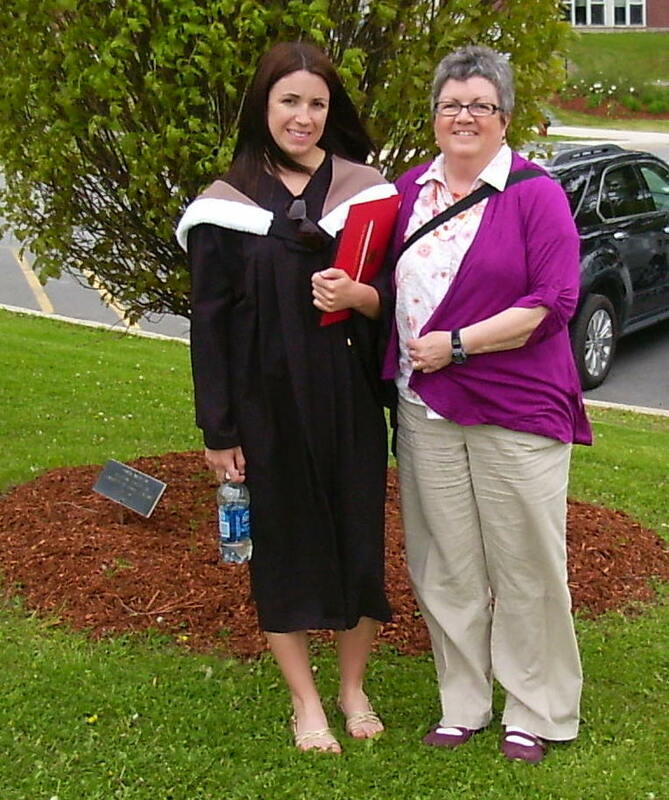 She worked for 3 years and then opted to return to the University of New Brunswick to finish her Bachelor of Business Administration. At that time 3 years seemed like forever, and we didn't know how we would do it all financially, but we did. There were many stresses and tears along the way, but she worked hard and she made it. Today, I was resting after our trip, but this afternoon when the sun came out I went for a little bike ride along the NB Trail. 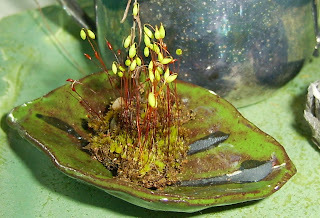 I brought home this tiny piece of moss to photograph. 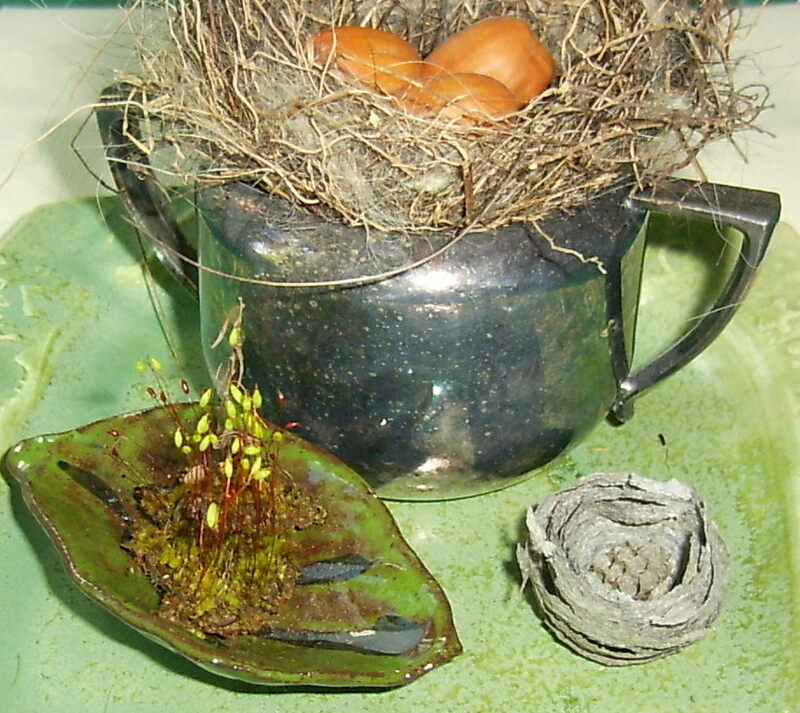 It is sitting in a little pottery leaf that I bought last week from Chal Baie here in Bathurst. It was made by a friend, Sarah Branch of Branch Designs. She also has an Etsy shop. And, yes that is a wasp nest in the second photo. I did manage to fix my mistake on my pen and brush roll. I think I will be dragging it along to lots of places to sketch and paint this summer. I made a mistake. When the weather took a turn for the worst today, I was so excited because I finally had enough energy to feel inspired to do a project. I spotted a paint brush roll in a book and thought that it was time to make one. 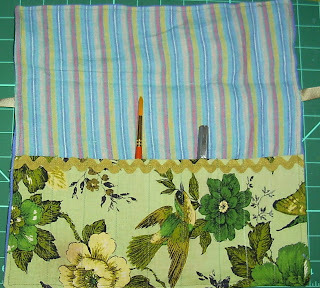 Grabbing my box of recycled linens, I cut out the pieces, resizing it to fit my smaller sized brushes, pens, and pencils. I just now finished it, turned it right side out, top-stitched it and tried it out. I discovered that when I re-sized, I forgot to adjust where to insert the ties, so now when you fold the flap down the ties are in the wrong place. I've put it aside to fix another day. Also, I've done a few more squares from my leftovers. It's slowly growing. 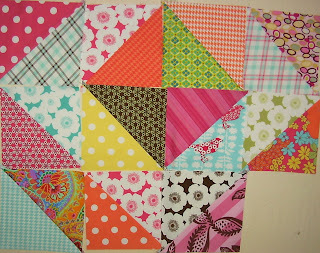 I'll be going out of town on Tuesday and I hope to find a suitable fabric for some of the squares and the border. Isn't this little fellow cute? 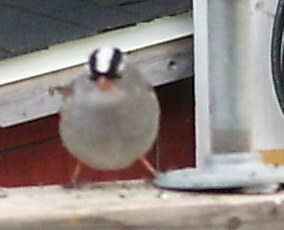 I believe he is a white crowned sparrow. 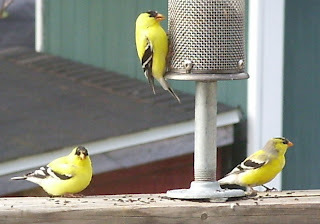 They were very shy at first, but are now coming to the little finch feeder on the deck. 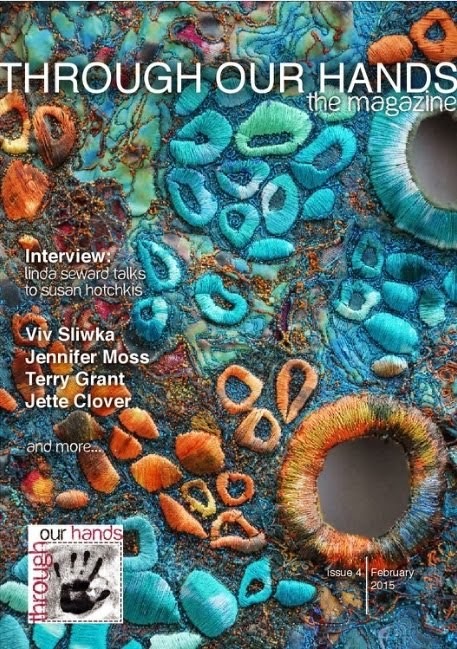 It's a little blurred due to cropping. 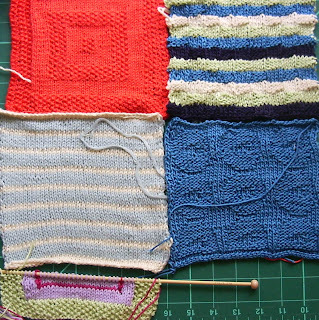 As for my current knitting project, I am doing a small afghan square by square. 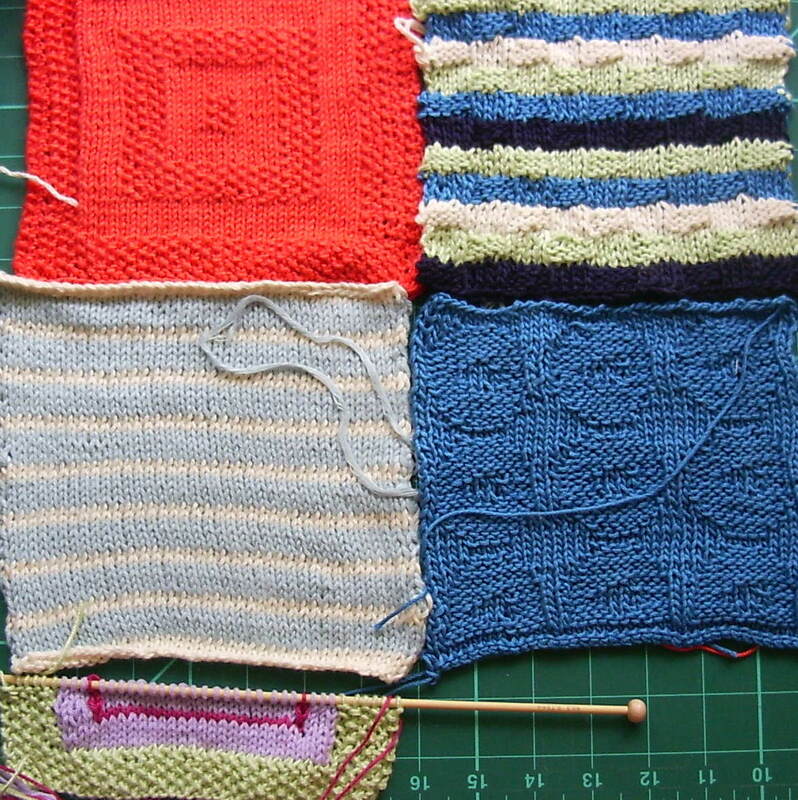 I'm using different colored cottons and some blocks form a library book called 'Blankets and Throws to Knit' by Debbie Abrahams. It's fun to knit but I don't know what it will be like to put together. 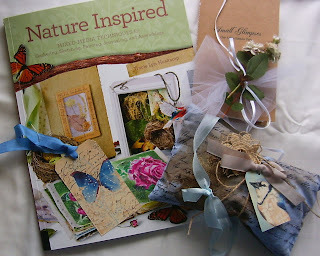 I've been slowly savoring the book Nature Inspired by Tracy Huskamp that I ordered along with a couple other items through her blog and Etsy shop. 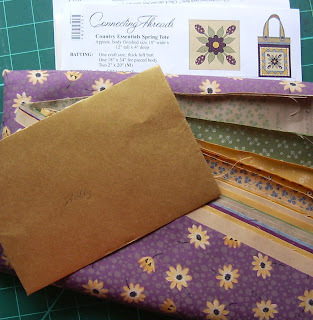 As usual with anything I've ordered it was lovingly wrapped with those little extras that show the care for every customer. If like me, you are one of those people who cannot come home from a walk inthe woods or on the beach wiothout something in your pocket, you would love this book. 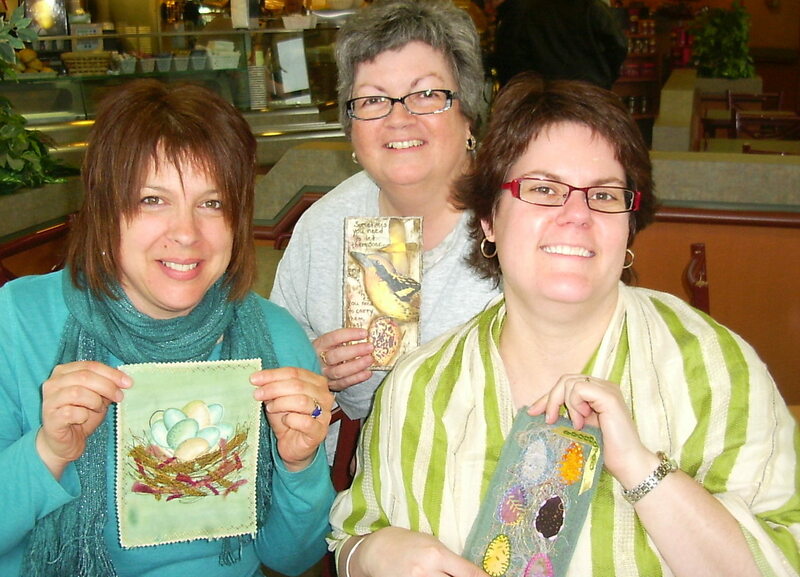 Tracy also incorporates my other fascination -birds- into her paintings and projects. 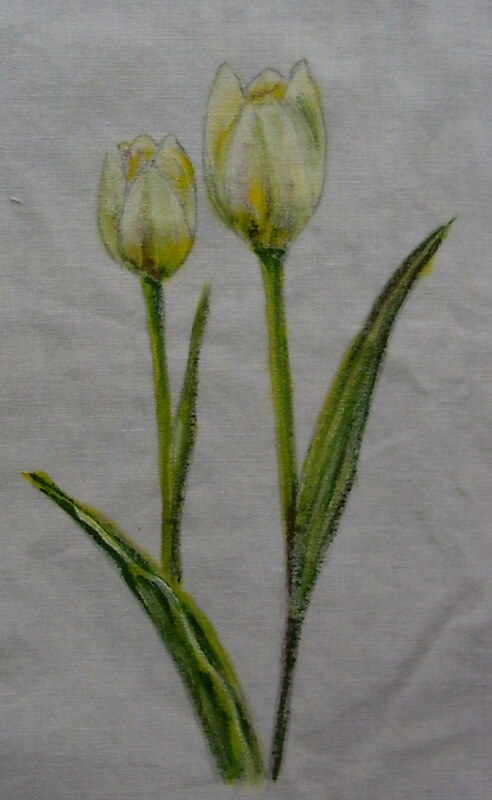 I've been 'inspired' to paint these tulips on fabric following the directions in the book. I will use them in a collage in Tracy's style. I love it! I also want to try to paint more birds. I'm not very good at it yet, so when they arrived at my deck feeder today, I decided to get few pictures. It seems like one was looking me in the eye. I was interrupting their feed. Finally, after a dew rainy days the sun came out today; even if it was a bit windy, it still made one feel good. I did a couple small errands this morning, had lunch with friends, and rested. After dinner I grabbed my poles and my camera and went for a walk on part of the NB Trail with my husband. When I was out the other night, I had taken pictures with a small pocket camera that came out blurred, and I wanted to try again with another camera. 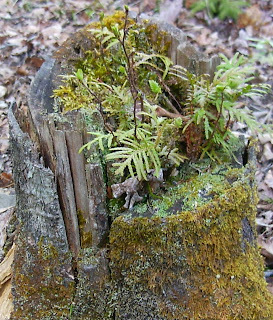 This tree stump with the tiny seedlings growing out of it caught my eye. It's like a whole little world growing on the top. 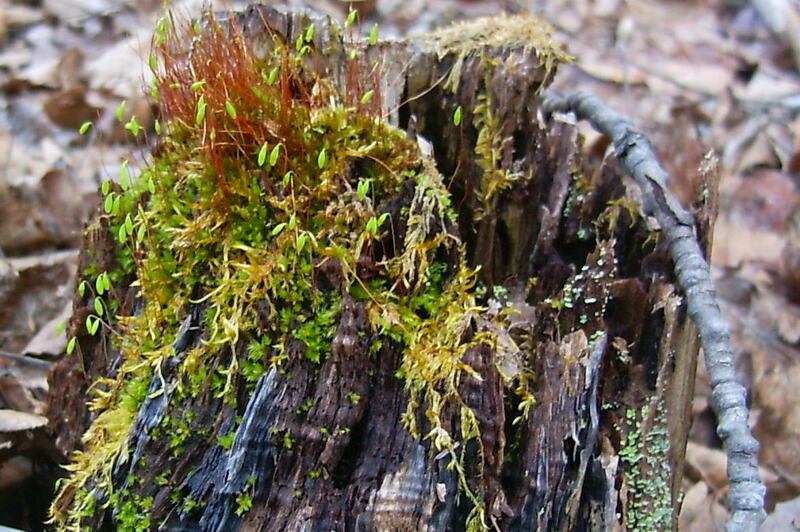 I can imagine the tiny creatures that could live there. 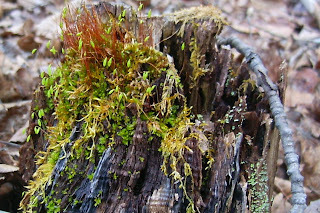 The second tree stump is a little smaller with beautiful, delicate mosses growing on it. In some ways nothing ever really dies-- it just gets recycled. Yesterday, I decided that some of my fabric bins needed cleaning, and I found a stack of triangles that were ends from another quilt. (I will show that one later once I iron it and take a picture of it). 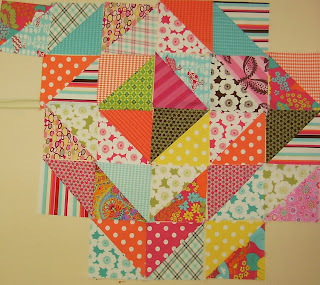 It needs to be sandwiched and quilted, which I do on my sewing machine, usually set up on my kitchen table. I stacked them into lights and darks (more or less) and randomly started to put a few together. 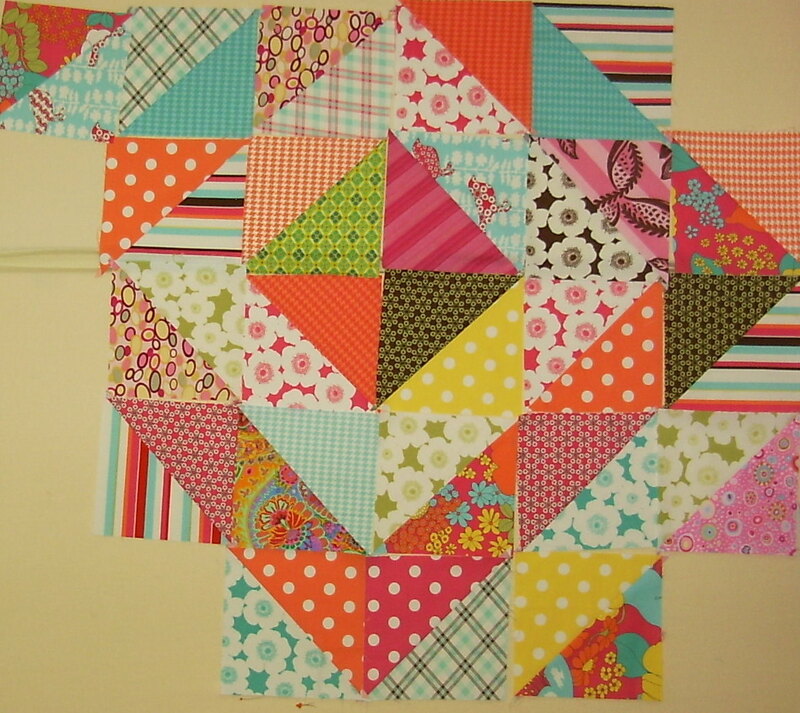 I haven't worked on a regular quilt since last summer, besides a baby quilt. I just felt like it, and it was the perfect thing to lift my spirits. I'm not sure how big it can get; there are not that many pieces...we'll see. I woke up to another sunny day today, and I'm cautiously optimistic that things are improving a little. It's almost like I'm emerging from a cocoon like all the other creatures that have been returning to the landscape. I get moving, tentatively flex the muscles, do a small task, res and then do a little more. It felt so good to be moving. I'm sure that the fact that it was warm and sunny helped. After doing a little real work for my actual job that I'm off from right now, I hung out a line of clothes, gathered my walking poles, and went for a walk down the NB Trail. At 17.5 minutes I turned around, so that I would not go over 35 minutes. I made it! I sat down to the sewing machine for the first time in a while to get one of the straps lengthened on this bag made by my friend, Nicole. 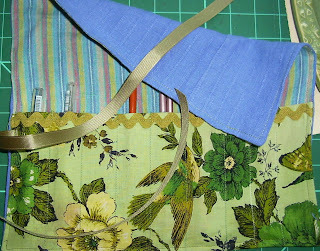 I like to be able to carry a bag with the handles across my shoulders so that my hands are free. I used an old tie for the first strap-- not the easiest material to work with when you're shaky. Here is a picture of Nicole and I from left to right and then Charlotte, holding each of our journal pages at out last swap. Last night my husband went to the final yoga session until, perhaps July when the teacher might do some at the beach; I hope to be able to return by then. I have been doing some basic moves at home. Once he came home and ate some dinner we went outside. 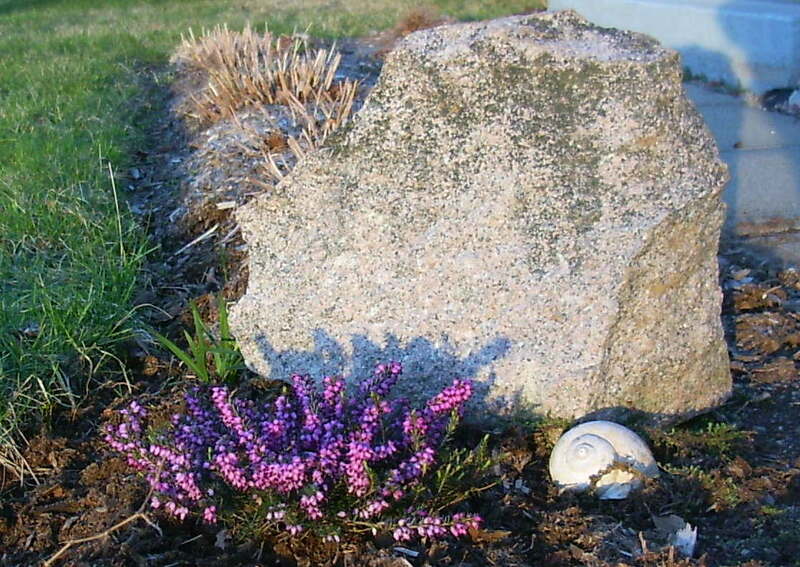 I planted this little heather plant by my front walk and it felt like such an accomplishment. It was actually still light at 8:30 last night, but you can see the shadows here in this picture. The sun was getting low. You might have noticed I've been a little intermittent with my blog posts recently. It is because I am still not well, still off work, and still undergoing tests to try to figure it all out. I haven't wanted to go into the boring details of it all because at the moment it's a waiting game. I feel like I'm caught in some sort of foggy sort of dream that I cannot emerge from, so I am resting and getting some little things done that are not all that interesting to write about. 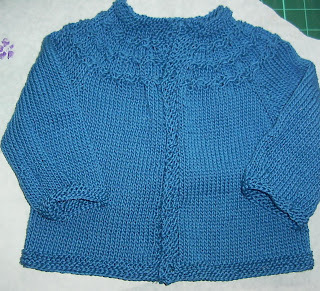 I did finish this baby sweater knit from a pattern that I found on Ravely. It is called the Seamless Yoked Sweater by Carole Barenys. I did leave the textured design off the sleeves and the bottom of the sweater, as instructed, if I wanted it to be for a little boy, but a couple of people have told me that they think it looks too girly. Most seem to think that it's just fine for a boy. Perhaps some masculine buttons would help. I'd love to hear some opinions on this. It is my friend Nicole's birthday today, and I'd like to wish her the best day. After my tests at the hospital this morning I dropped off a little package to her at her work. 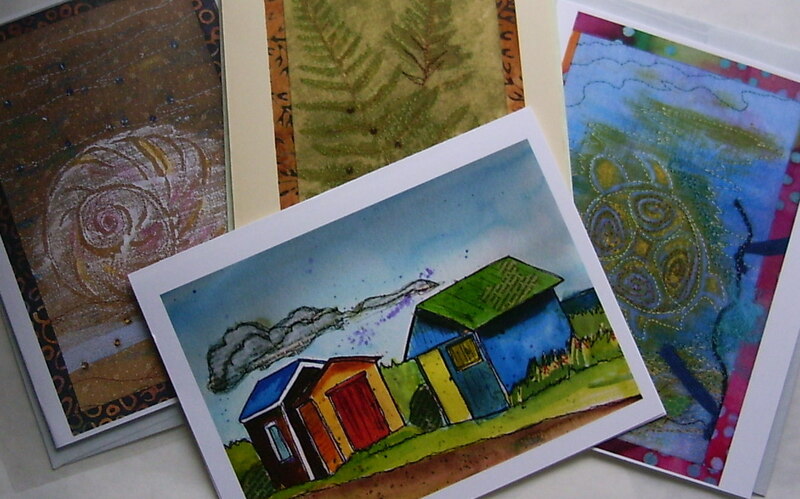 These are a few of my note cards that are copies of my postcard quilts (except for the fish huts which are done on watercolor paper). 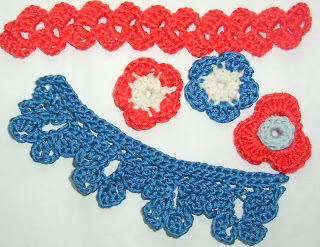 I also included some little bits of trim that I tried from the book Crochet Adorned by Linda Permann. 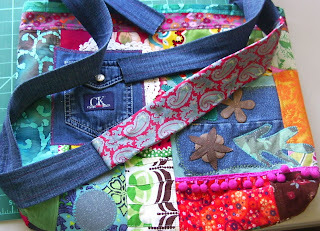 Nicole does recycled art and makes wonderful bags from recycled fabric, so I thought she might like these bits. 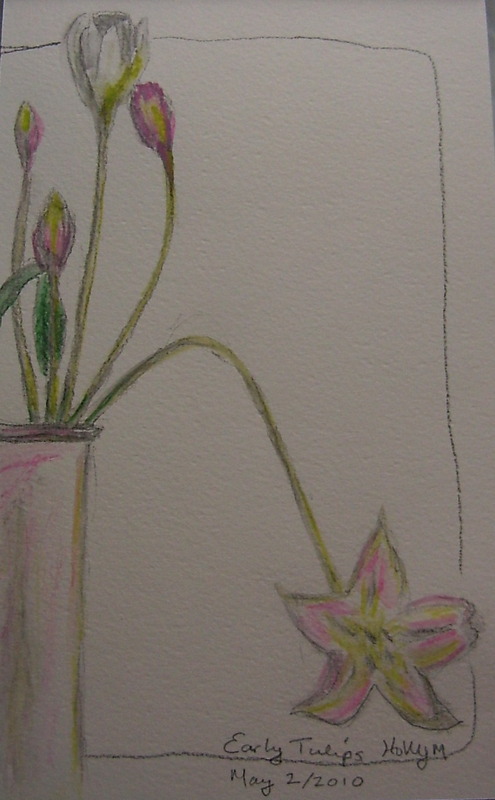 Finally, last night after watching the Amazing Race, I took a few minutes to try this new water soluble pencil that I bought a couple weeks ago in Fredericton.. I'd read about it but not seen it before. I definitely will be using it more. I love the feel of it while sketching and the way it dissolves with the brush and water is lovely. I have a few good hours in a day in which I try to fit in the necessities and then some fun things. I am unable to spend much time at the sewing machine, so perhaps I won't be too prolifiic with art quilts for a bit. 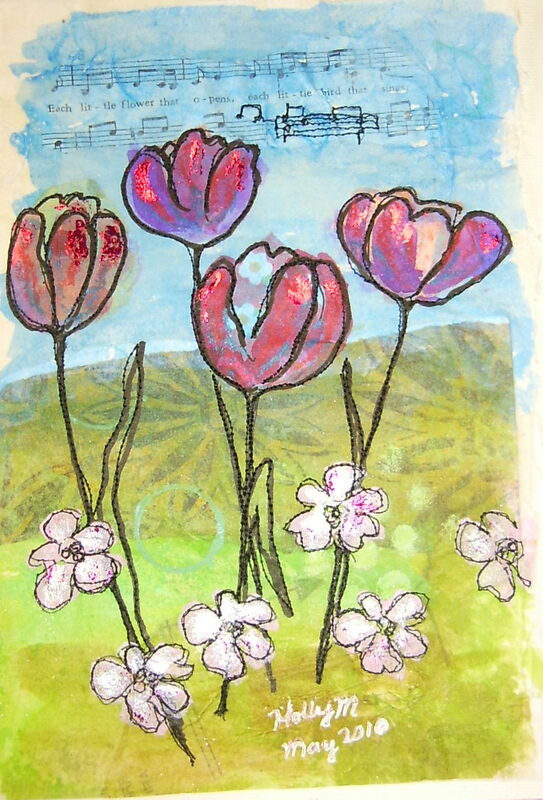 I am passing my time knitting, sketching, making foam stamps, and doing little things. The weather here is warming and despite the rainy weather forecast for this week, we have had good temperatures and thus the gardens are weeks ahead of our usual schedule. I have cleaned out 3 little gardens after suppers at night this week-- that seems to be when I feel a little better. 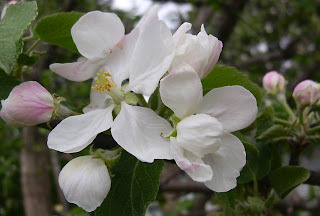 Yesterday, I made a list of the few flowers and some vegetable seeds that I want to purchase for planting. This also cuts into quilting time, but I love to be out in the garden and I love to sit and sketch out there once it gets growing. My yard is very modest, but I will take a few pictures the next time it stops raining.